Some games require static spawning, while other games can simply play better with static spawning. For Halo: Reach, the primary mechanism to enforce static spawning was the Respawn Zones. With Halo 4, the Respawn Zone is relatively weak and must be layered several deep to even come close to guaranteeing static spawning behavior. While forgers shun team assigned Respawn Points for the eloquence of Respawn Zones in Reach, given its efficiencies, team assigned Respawn Points is the correct way in Halo 4 to ensure static spawning. 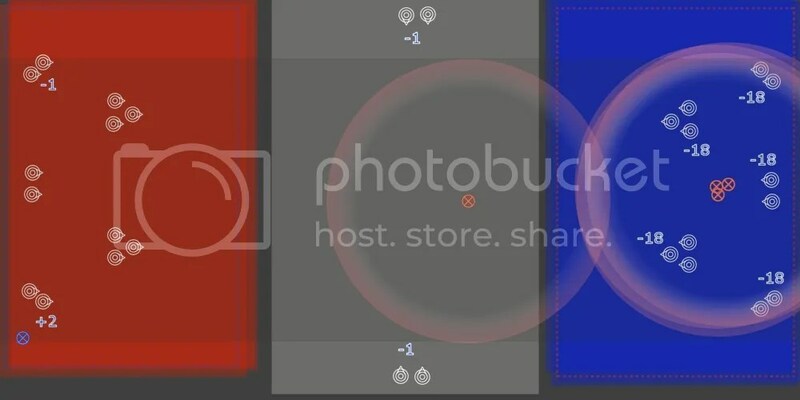 Games like Ricochet and CTF require static spawning to function properly, due to the base centric objective architecture of the game itself. Other games like Slayer, KOTH, and Extraction, when played on a fully symmetrical map, can play better with static spawning by properly rewarding the team that successfully pushes the center of the map. Additionally, static spawning (and the games that require static spawning) should be forged only into symmetrical maps, lest a team enjoys an advantage from spawning on their side of the map. In his blog post, [Audley] suggests stacking three Respawn Zones on a team’s 1/3 of the map, a Weak Respawn Zone (WRZ) or no zone at all in the middle, and an Anti Respawn Zone (ARZ) on opposing team 1/3 of the map. Because I have seen a few maps that actually implement his model, I wanted to discuss it in more detail. Consider the following scenario. In the blue third of the map, the weights for the Respawn Points are 3RZ + 3PE = 42 – 60 = -18. The emergency Respawn Points in the middle are surrounded by a WRZ, but the fourth red player’s PE Secondary is applying about -3 to all of them, so their weight is 1 – 3 = -2. Finally, a blue player is in the far back of the red end of the map and presents a +3 influence upon the nearest Respawn Points, which are covered in a -2 ARZ and suffers -1 from the fourth red player’s PE Secondary. The total weight on the Respawn Points nearest the blue player is 0, but they are now the highest weighted Respawn Points on the map. The blue players will spawn there instead. Widening the map doesn’t always solve this problem – even though the differences in weights are less dramatic, in many cases they can still yield the highest weighted Respawn Point on the wrong side of the map. The fundamental problem with Audley’s approach is that the differentiation between the middle and the far 1/3 of the map is only +2 or +3, which is well within range of being manipulated by the PE Secondary and the PA Influencers. The margins that the ARZ and WRZ yield are simply too small for what we need. If you put a single neutral Respawn Zone in the middle third, then it will stand out much higher than the enemy third (from either team’s perspective) as a safe backup to the team’s third. The introduction of the uber strong (over +200) weight of the Respawn Zone when the Rico_Respawn label attached (only for Ricochet games) demonstrates that even 343i recognizes that stacking Respawn Zones three deep for a net weight of +42 is inadequate. For games like CTF, the Ricochet uber Respawn Zone isn’t available, leaving only team assigned Respawn Points as a valid option for static spawning. Another issue to consider is how many layers of Respawn Zone do you stack to achieve a more solid spawning experience? The Reach spawn engine and the Halo 4 spawn engine both demonstrate a failure to apply the weight of Respawn Zones when too many are forged onto the map. This is a known bug in the spawn engine code. It was said that the collection objects were never intended to hold more than just a few for a single game. The purpose of Reach’s Respawn Zone was to make spawn setup much easier for the forger by shifting the team assignments of many Respawn Points scattered around the map to just a few Respawn Zones typically located at the same location on the map. But given Halo 4’s Respawn Zones lack of efficiency and effectiveness, team assigned Respawn Points are left as the only valid solution for static spawning. Forgers need to stop asking How can I use Respawn Zones to implement static spawning? and start asking How can I implement static spawning? Though this is a trivial point, it is worth mentioning – Team assigned Respawn Points never fail to any negative influencer, including the LOS influencer. The only negative aspect of team assigned Respawn Points is that they become a maintenance nightmare if not planned correctly. I have adopted some rules that help me minimize the effort I have to put out to setup and adjust spawning when using team assigned Respawn Points. One of the benefits in Halo 4 forge is that any object can now have up to four game type labels assigned to it. Any one of them can lead to the object spawning onto the map if the game type label matches or applies to the game type in use; and any of them can prevent an object from spawning onto the map if the game type label is the NOT version of the game type in use (e.g., NOT_DOMINION, EXT_DELETE, NOT_RICOCHET). This means that one set of team assigned Respawn Points can be forged for static spawning for up to four games, while another set of neutral Respawn Points can e forged for dynamic spawning for up to four games. It is my belief that in most cases a map should be designed so that only Dominion uses neutral Respawn Points and all other game types that the map supports uses team assigned Respawn Points. This means that the team assigned Respawn Points can all have the following configuration: GAME_TYPE = NOT_DOMINION, GAME_SPECIFIC = FALSE. Likewise, all neutral Respawn Points can have the configuration: GAME_TYPE = DOMINION, GAME_SPECIFIC = TRUE. A quick word about the labels that are used to prevent an object from spawning on a map for a specific game type. Currently Ricochet, Extraction, and Dominion each have the ability to designate an object to NOT spawn on the map for their respective game types. Generally these NOT labels (as I call them) are used when other label types are not used and the GAME_SPECIFIC label is set to FALSE. By setting the GAME_SPECIFIC label to FALSE, the object will spawn in any game except the game type that the NOT label is associated with. I have discovered that Slayer will use any team neutral Respawn Point. Slayer game type variants appear to dishonor the Game Type label and the Game Specific label. That being said, it appears that the publisher feels Slayer should be a dynamic spawning game experience in Halo 4 - or this is merely another bug that got past their QA team. I am increasingly of the opinion that for any game type, particularly Slayer, dynamic spawning is simply wrong. As a team pushes up the middle and pushes back the enemy to their base, we see that dynamic spawning presents spawning experiences that intuitively counter rewards and movement. 1. Dynamic spawning shifts the rewards from the team pushing through the middle to the team being pushed back against their base. As in a hysteresis, there comes a point where the team being pushed back will flip from being increasingly punished to being instantly rewarded, as they begin to spawn behind the team that has successfully taken control of the middle. 2. A team will not find pushing beyond the middle appealing, and their movement can stagnate or take unintended paths. Problems that one needs to look out for are spawn traps (and spawn killing). If the map design lends itself to easily setting up spawn traps that can shut down the game play for one team and offering the other team a huge unbalanced advantage with the objective, then there is something wrong with the map itself. Don’t ask how to use Respawn Zones to implement Static Spawning, but rather how to implement static spawning in Halo 4? Team Assigned Respawn Points are the correct way of ensuring static spawning in Halo 4, and the new labeling helps make this easily managed in forge. Static spawning model is proving to be the more correct model for rewarding players, and is my preference in all my maps when the map is symmetrical and spawn traps are not easily prosecuted.